For those seeking superior comfort with something a little extra, this Posture Pocket Plus is the ideal bedroom solution. 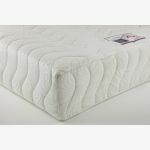 Delivering the comfort that our mattresses are known for this offers extra support, with the addition of an extra dense foam encapsulations of the individual pocket springs (1000 at king-size). A sumptuous memory foam top layer completes this single mattress. The luxury quilted cover allows air to circulate across the mattress, and the knitted stretch fabric ensures the memory foam’s movement is not restricted. Our Extra 1000 Pocket Spring mattresses provide excellent support through the night; check out our Supportive mattresses for those seeking a more gentle rest. Our mattresses are made to work with our slatted bed frames to make sure you have a great night’s sleep.